Nazo ni Semare! Tsume Raidingu Dyueru!! Press Him About the Mystery! The Endgame Riding Duel!! "Press Him About the Mystery! The Endgame Riding Duel!!" is the one hundred and fifteenth episode of the Yu-Gi-Oh! 5D's anime. it first aired in Japan on June 23, 2010. 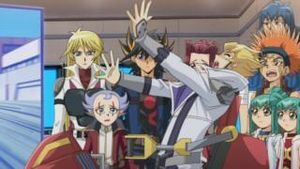 Lazar tells Yusei and company what he knows about Iliaster. In order to find the name of the company who sent the Three Pure Nobles as the new Directors, Lazar takes the group to the arcade game Accel Simulator, which has a secret database hidden behind some puzzles. 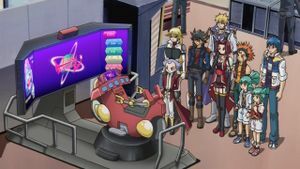 Lazar sits at a table and is faced by Yusei, Sherry, Akiza, Crow, Jack, Bruno, Leo and Luna, who wait for him to tell them what he knows about Iliaster as he promised. Lazar laughs nervously and Sherry fires a card at him, which he barely dodges, leaving it lodge into the chair behind him. Sherry asks him to tell them about the relationship between Public Security Maintenance Bureau and Iliaster. Lazar removes the card from his chair, gulps and says that he understands. One day, he went to the bureau's office and then Iliaster got him involved, he tells them. He picks up a cup of Red Demon's Noodle and says that it all began with cup ramen. Yusei asks what he means and Lazar starts to talk about his family's past. Lazar's family in the circus. Lazar and his family lives in a small circus tent. A flashback, shows him, his brother, sister, mother and father all performing at a circus. Although they were well engaged, only a few people came to visit them. In the present, Lazar starts to peel open the lid of the noodles as he explains this, but Jack slams his fists on the table, asking since when does Lazar eat his Red Demon's Noodle. Jack says that it is the last one and demands that Lazar return it. Yusei tells Jack to calm down for the sake of the valuable information. Jack turns around, folds his arms grumpily and tells Lazar to eat it. Lazar happily complies and quickly swallows a large portion of it, remarking that it was delicious. "Of course it is", Jack yells and orders him to continue with the story. Lazar looks into the cup and says that he then when he met his first cup ramen... A flashback shows Lazar at home. A Kiiroi Itachi cup ramen is placed on the table before him. His younger and brother and sister are both pleasantly surprised. His mother says that it is a gift for his birthday, but Lazar is concerned because it is such an expensive meal. He suspected that she had to sell her clothes in order to buy it. His brother and sister both urge him to eat it. Lazar starts crying and decides not to eat it alone and shares some with his siblings. 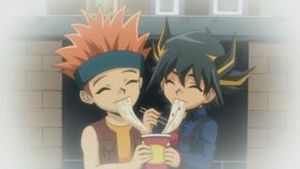 Crow and Yusei sharing cup ramen at Martha's. In the present, Lazar's eyes are watering and he says that that ramen was delicious. Crow looks down and guiltily says that he had always seen clowns as monsters. Jack is truly moved by the story and says that it was the same with him; At Martha's place, he and his friends always ate ramen. Flashbacks show Yusei, Jack, Crow and two other boys eating ramen at Martha's. He says that he still doesn't forget the taste and slams six boxes of ramen onto the table, insisting that Lazar take them for himself and his family. He is reminded by Akiza that he said the one Lazar ate earlier was his last one. Lazar's eyes gleam. He comments that the products are so rare and asks if Jack is sure he is okay with this. Jack clasps Lazar's hands and says "That is right. I, Jack Atlas, am not selfish". 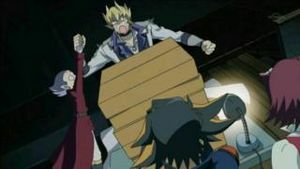 Yusei asks Jack to wait, but Jack tells him to shut up, forgetting to let go of Lazar as he turns to Yusei, consequentially pulling him around. Jack asks if Yusei has not forgotten the taste. Yusei replies that he hasn't, but asks what all this has to do with Iliaster. 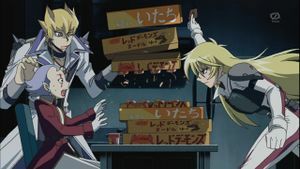 Sherry uses a card to slice through one of the boxes, knocking its contents and the boxes above it onto the floor. Sherry cuts through the boxes. Lazar gets back to the main topic. He takes out a set of chopsticks and says that his relationship between the Public Security Maintenance Bureau and Iliaster is that after he ate that cup ramen, he swore that he would eat it again someday. A flashback shows him leaving his family with a sack on his back. He says that he then started his life with the Public Security Maintenance Bureau. He worked under Director Goodwin and worked his way up to becoming vice-director. He was then able to feed his wife and son and also gave cup ramen to his parents. That is all his talk of the Public Security Maintenance Bureau and cup ramen, he says. Sherry then stands in front of him and asks about Iliaster. She seizes him by the collar and lifts him up. After all this waiting, she asks if he has finished talking about that nonsense. Yusei calms her down a little and she releases Lazar. Bruno asks if Lazar said that he was involved with Iliaster. Lazar stutters a bit and says that remembering that name makes him and his family scared. Crow says that that is okay, but jokes that if he doesn't talk about Iliaster Sherry might kill him. Lazar looks at Sherry in fear and says okay. Yusei comments that the incident left too much damage on New Domino and if they let them continue, people won't be able to eat cup ramen or even do simple things. He asks if Lazar wants that future. Lazar thinks of his family members eating cup ramen and reflects on when he left his wife and son at Martha's. Lazar understands and agrees to tell them everything this time. The conversation is skipped. After Lazar has told them everything he claims to know, he asks if they need any help. Crow notes that Iliaster's goal is to destroy the place, while their goal is to reveal their identities. Iliaster's goal is weird, Crow thinks and Yusei reflects on his meting with the Three Emperors of Iliaster. Jakob said that their goal is to change the future. In the present, Jack repeats that their goal is to change the future and recreate Ener-D. To achieve that, they need to erase New Domino from existence. Lazar is shocked to learn that this horrible thing is Iliaster's true motive. Crow points out that that is why they told him to listen. Fed-up with Lazar, Jack starts taking back the ramen unless Lazar starts talking. Lazar desperately apologizes and claims to remember something else. He tells them about a time when he got a phone call from an outside company who sent the three directors. [Note 1] Yusei asks what their name is. Lazar informs him that most of the stuff has been recorded in a database by the Public Security Maintenance Bureau. Bruno asks where the database is. Lazar smiles and starts to reply. The group arrive at an arcade, Game Paradise. Among the games, is one resembling a Duel Terminal. Lazar brings the group over to a Turbo Duel simulator, called Accel Simulator. The high scores for the game belong to AAAA, KING, @@@@ and HIRO. Jack asks why the database is located here. Lazar snickers and replies that only a few people know it is here. Leo points out that it is nothing more than a game machine. Lazar is aware and explains that nobody would think that a database with access to terminal stations would be in such a place. Even if someone is following you, the data will remain safe. Lazar leaps onto the attached Duel Runner. He laughs that you can goof off gaming while on duty. Leo wonders if Lazar is really telling the truth. Luna can't decide if this is awesome or not. Once Lazar sets up the game, he touches the screen. Much to Crow's surprise, Cup Ramen Man appears on the screen as Lazar's opponent. Cup Ramen Man starts with 1800 Life Points, 4 SPC, 2 cards in his hand and "Cup Meatball Cayenne" on the field in Attack Position. Lazar has 1000 Life Points and 4 SPC. 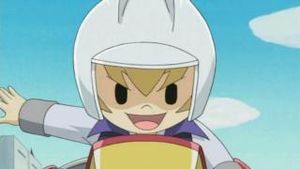 His field contains "Jester Lord" in Attack Position and "Raigeki Break" face-down. His hand contains "Jester Confit" and "Speed Spell - Speed Energy". Yusei realizes that this is a simulation Turbo Duel and Lazar explains that rather than a password it uses a simulation Turbo Duel. The Duel starts and Lazar explains that there are two problems that you are given three chances to solve, meaning if you fail to solve it three times, the computer will lock you out. After Lazar goes through what cards are on the field, Jack suspects that he must increase the ATK of "Jester Lord" in order to win. Lazar agrees; "Jester Lord" gains 1000 ATK for every Spell and Trap Card on the field if it is the only monster on the field. So Lazar Sets "Speed Spell - Speed Energy" and activates the face-down "Raigeki Break", discarding "Jester Confit" to destroy "Cup Meatball Cayenne". Cup Ramen Man explains that when "Cup Meatball Cayenne" is destroyed, it destroys every card in Lazar's hand. "Cayenne" sprays a liquid past Lazar's avatar. Since Lazar has no cards in his hand, it does nothing. Being the only monster on the field, "Jester Lord" gains 1000 ATK for the 1 Spell Card in Lazar's Spell & Trap Card Zone. Lazar attacks Cup Ramen Man directly with "Jester Lord", dropping Cup Ramen Man's Life Points to 800. Cup Ramen struggles to stay balanced on his skateboard-like Duel Runner. However since he still has Life Points and Lazar was supposed to win on one turn, he tells Lazar that he has been rejected and fires a liquid out of his arms creating an oil slick and causing Lazar's avatar to lose control of his Duel Runner and fall off. In the arcade, Lazar has gone white. Jack yells asking what he is doing. Crow thought that he already had the problem solved. Lazar frantically waves his arms around saying that the problems have always been left to the subordinates. Yusei suspects that the Turbo Duel may need a unique strategy. Crow thinks that he may have a strategy and steps forward. However, Akiza stops him and suggests that she try it instead. She believes that she has had enough practice in Turbo Duels to handle this and wants to help everybody. The others agree and Akiza gets into the Duel Runner. Since this requires a unique strategy, Akiza thinks she should try to use the effect of "Speed World 2". The Duel starts and Akiza uses "Speed World 2's" effect. She removes her four Speed Counters to inflict 800 damage to Cup Ramen Man for each "Speed Spell" in her hand. Since she has 1, it inflicts 800 damage. From there, Akiza uses the same strategy as Lazar, taking out Cup Ramen Man's remaining 1000 Life Points. The CPU says "You win!" and her avatar winks. Leo and Luna start to celebrate. Lazar realizes his mistake, but Jack says that he should have already know that. Akiza gets down and Crow and Yusei congratulate her. Sherry points out that it is too early to celebrate yet, there's still another puzzle. Jack leaps onto the Runner, insisting that they leave it to him. This time, Cup Ramen Man has 4000 Life Points, 10 SPC, 4 cards in his hand and his field contains "Cup Ramen Lard", "Cup Udon Uno" and "Cup Meatball Cayenne", all in Attack Position. Jack has 300 Life Points, 10 Speed Counters, his hand contains "Speed Spell - Speed Energy", "Speed Spell - High Speed Crash", "Discord" and "Imperial Custom" and his field contains "Jester Lord" and "Jester Queen", both in Attack Position, "Begone, Knave!" and "Speed Spell - End of the Storm" both face-down in his Spell & Trap Card Zone. Jack goes over the effect of "Jester Queen", which allows him to attack once for every Spell and Trap Card in his Spell & Trap Card Zone, if she is the only monster he controls. Crow goes over "Cup Ramen Lard" and "Cup Udon Uno's" effects, which destroy all monsters and all Spell and Trap Cards respectively when destroyed. And they're combined with "Cup Meatball Cayenne's" troublesome effect. Jack claims that the details don't matter. His Speed Counters are at ten, which he won't let go to waste. He tells everyone to bear witness to his overwhelming power. Jack activates the effect of "Speed World 2" twice, removing 4 counters to inflict 800 damage times the number of "Speed Spells" in his hand. Cup Ramen Man takes 1600 damage. Jack use the effect again, to inflict another 1600 damage. Cup Ramen Man's Life Points are left at 800. Yusei is impressed to see 3200 damage inflicted already. Crow says that Jack is still an overwhelming force. Jack activates "Speed Spell - Speed Energy" to increase the ATK of one of his monsters by 200 for each Speed Counter he has. He chooses "Jester Queen" and her ATK rises to 1200. He Sets the 2 Trap Cards that were in his hand and activates "Speed Spell - High Speed Crash". Since he has at least 2 Speed Counters he is able to destroy 1 card on each side of the field. He chooses "Jester Lord" and "Cup Meatball Cayenne". The effect of "Cup Meatball Cayenne" activates, but does nothing as Jack has no cards in his hand. Now that "Jester Queen" is the only monster, Jack controls she gets to attack once for every card in Jack's Spell & Trap Card Zone, which is four. Jack declares an attack on "Cup Ramen Lard". Yusei tries to stop him. Jack asks what it is. Yusei tries to remind him of "Cup Ramen Lard's" effect, but is too late, as Jack has already entered the move. The effect of "Cup Ramen Lard" activates and destroys all of Jack's monsters. "Cup Ramen Lard" fires an array of noodles, destroying "Jester Queen". Since Jack has no monsters left, Cup Ramen Man says that he has been rejected. Cup Ramen Man's cup opens and fires a beam at Jack's avatar, knocking him off his Duel Runner. In the arcade, Jack is disgusted. Crow tells him off, reminding him that although he had 4 attacks, he wouldn't be able to destroy "Cup Udon Uno" since it has higher ATK than "Jester Queen". Jack argues that he had to consider one in his hand and the opponent had only 200 Life Points left. That still wouldn't make it 0, Crow retorts. Lazar tries to calm the two down, but they both tell him to shut up. Sherry points out that they have only one chance left. Yusei says that using the effect of "Speed World 2" wasn't wrong and he thinks he knows a different way. He says that the problem is timing. Jack is unsure what he means by that. Yusei insists that they just watch him and he sits into the Duel Runner. Yusei starts off the same as Jack, by using the effect of "Speed World 2" to inflict 1600 damage. Cup Ramen Man says that this is getting ridiculous as he takes the hit. Jack says that that is it and once Yusei does that again, Cup Ramen Man will have just 800 Life Points left. Leo doubts this strategy, thinking it is the same as the previous attempt. However, Yusei decides not to inflict the second set of damage right away. To his friends' surprise he uses "Speed Spell - Speed Energy" next to increase "Jester Queen's" attack by 200 times the number of Speed Counters he has, which is 6 this time. Her ATK rises to 2000. Now Yusei uses "Speed World's" effect to remove 4 Speed Counters and inflict 800 damage times the number of "Speed Spells" in his hand, which is only 1 this time. Cup Ramen Man's Life Points drop to 1600. Jack doesn't understand why Yusei didn't take the chance to inflict the full 3200 damage. However Akiza and Crow realize that he intended to reduce the damage inflicted for the sake of giving "Jester Queen" more ATK. Yusei activates "Speed Spell - High Speed Crash" to destroy "Jester Lord" and "Cup Udon Uno". The effect of "Cup Udon Uno" activates and spills soup on the field, destroying the cards in Yusei's Spell & Trap Card Zone. Akiza wonders why he chose "Udon Uno". Luna points out that without cards in his Spell & Trap Card Zone, "Jester Queen's" effect won't work. However, Yusei Sets the two Trap Cards from his hand. This only gives "Jester Queen" 2 attacks, but 2 is all he needs. Yusei attacks "Cup Meatball Cayenne" with "Jester Queen". The effect of "Cayenne" activates, but Yusei has no cards in his hand. Next "Jester Queen" attacks "Cup Ramen Lard", eating the noodles from its head as she does so. The two attacks, reduce Cup Ramen Man's Life Points to 0. He falls from his Duel Runner, saying "This should have ended in China". The CPU says "You win!" 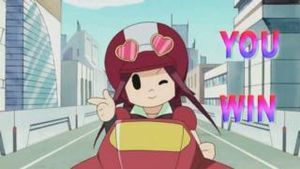 and Yusei's avatar gives a thumbs up. 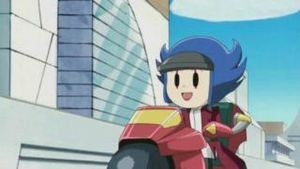 Jack congratulates Yusei, but Yusei says that he didn't do it alone; Jack and Akiza helped him. Lazar asks what about him, but Sherry hurries him into retrieving the data. Lazar pushes some buttons and binary code starts flowing through the screen and forms an image of a company's logo. Lazar says that this is the company who sent the three directors. The group realize that the company is Momentum Express Development Organization. The game only allows three credits. Failure to solve the puzzle in one turn results in the loss of a credit. Field contains "Jester Lord" ( 1/0/0) in Attack Position and "Raigeki Break" face-down. Hand contains "Jester Confit" and "Speed Spell - Speed Energy". Field contains "Cup Meatball Cayenne" ( 5/1600/1600) in Attack Position. Lazar Sets "Speed Spell - Speed Energy". He then activates his face-down "Raigeki Break" to discard "Jester Confit" to destroy "Cup Meatball Cayenne". The effect of "Cup Meatball Cayenne" effect then activates which would destroy all cards in Lazar's hand, but Lazar has an empty hand. "Jester Lord" gains 1000 ATK due to its effect ("Jester Lord": 0 → 1000/0). "Jester Lord" attacks directly (Cup Ramen Man 1800 → 800). Since Lazar could not defeat Cup Ramen Man in one turn, Lazar loses (Credits: 3 → 2). Akiza activates the effect of "Speed World 2" to remove four Speed Counters (Akiza's SPC: 4 → 0) and inflict 800 damage for each "Speed Spell" in her hand. Akiza reveals "Speed Spell - Speed Energy" (Cup Ramen Man 1800 → 1000). Akiza then Sets "Speed Spell - Speed Energy". Akiza then activates her face-down "Raigeki Break" to discard "Jester Confit" and destroy "Cup Meatball Cayenne" ("Jester Lord": 0 → 1000/0). The effect of "Cup Meatball Cayenne" activates, but Akiza's hand is empty. "Jester Lord" attacks directly (Cup Ramen Man 1000 → 0). Field contains "Jester Lord" ( 1/0/0) in Attack Position, "Jester Queen" ( 2/800/800) in Attack Position, "Begone, Knave!" face-down and "Speed Spell - End of the Storm" face-down. Hand contains "Speed Spell - Speed Energy", "Speed Spell - High Speed Crash", "Discord" and "Imperial Custom". Field contains "Cup Ramen Lard" ( 3/600/600) in Attack Position, "Cup Udon Uno" ( 4/1400/1400) in Attack Position and "Cup Meatball Cayenne" ( 5/1600/1600) in Attack Position. Jack activates the effect of "Speed World 2" to remove four Speed Counters (Jack's SPC: 10 → 6) and inflict 800 damage to Cup Ramen Man for each "Speed Spell" in his hand. Jack reveals "Speed Spell - Speed Energy" and "Speed Spell - High Speed Crash" (Cup Ramen Man 4000 → 2400). Jack then activates the effect of "Speed World 2" by removing four Speed Counters (Jack's SPC: 6 → 2) and revealing "Speed Spell - Speed Energy" and "Speed Spell - High Speed Crash" (Cup Ramen Man 2400 → 800). Jack then activates "Speed Spell - Speed Energy" to increase the ATK of "Jester Queen" by 200 for each Speed Counter he has ("Jester Queen": 800 → 1200/800). Jack Sets "Discord" and "Imperial Custom". He then activates "Speed Spell - High Speed Crash" to destroy "Jester Lord" and "Cup Meatball Cayenne". The effect of "Cup Meatball Cayenne" then activates, but Jack's hand is currently empty. Due to the effect of "Jester Queen", it can attack a number of times equal to the number of Spells and Traps that Jack controls. "Jester Queen" attacks and destroys "Cup Ramen Lard" (Cup Ramen Man 800 → 200). The effect of "Cup Ramen Lard" then activates, destroying "Jester Queen". 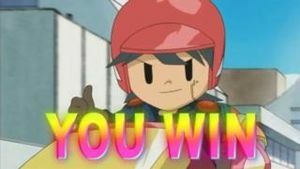 Since Jack could not defeat Cup Ramen Man in one turn, Jack loses (Credits: 2 → 1). Yusei activates the effect of "Speed World 2" to remove four Speed Counters (Yusei's SPC: 10 → 6) and inflict 800 damage to Cup Ramen Man for each "Speed Spell" in his hand. Yusei reveals "Speed Spell - Speed Energy" and "Speed Spell - High Speed Crash" (Cup Ramen Man: 4000 → 2400). Yusei then activates "Speed Spell - Speed Energy" to increase the ATK of "Jester Queen" by 200 for each Speed Counter he has ("Jester Queen": 800 → 2000/800). Yusei then activates the effect of "Speed World 2" by removing four Speed Counters (Yusei's SPC: 6 → 2) and revealing "Speed Spell - High Speed Crash" (Cup Ramen Man 2400 → 1600). Yusei activates "Speed Spell - High Speed Crash" to destroy "Jester Lord" and "Cup Udon Uno". The effect of "Cup Udon Uno" then activates, destroying all Spell and Trap Cards Yusei controls. Yusei Sets "Discord" and "Imperial Custom". "Jester Queen" attacks and destroys "Cup Meatball Cayenne" (Cup Ramen Man 1600 → 1200). The effect of "Cup Meatball Cayenne" then activates, but Yusei's hand is empty. "Jester Queen" attacks and destroys "Cup Ramen Lard" (Cup Ramen Man 1200 → 0). The following cards appear in this episode. Cards in italics debuted here. ↑ 1.0 1.1 1.2 1.3 1.4 tv-toyko.co.jp Yu-Gi-Oh! 5D's "Press Him About The Mystery! The Endgame Riding Duel!!" #066 "A New Threat, Part 2"
#119 "The Impregnable Scrum! Crush the Unbreakable Defense!" #111 "The Ancient Land - To Nazca"
#132 "Dawn of the Machines"
#126 "When Nordic Gods Attack"
#113 "Burning, Seething Soul! Scar-Red Nova Dragon"
#121 "The Miraculous Trump Card, Zushin the Sleeping Giant!" #087 "Showdown at Sundown, Part 1"
#131 "The Beginning of the End"
#089 "The Race to Escape, Part 1"
#139 "The Enchanting Field! École de Zone"
#096 "Natural Instincts, Part 1"
#084 "Will The Real Jack Atlas Please Stand Up, Part 2"
#115 "Press Him About the Mystery! The Endgame Riding Duel!!" #102 "The Edge of Elimination, Part 3"
#071 "French Twist, Part 1"
#079 "Putting It All Together"
#097 "Natural Instincts, Part 2"
#146 "The Last Human, Z-ONE"
#072 "French Twist, Part 2"
#110 "Primo's Plan, Part 5"
#069 "A Duel With Interest"
#095 "Keeping a Promise, Part 2"
#130 "Bound to the Future, Bonds to Our Companions"
#065 "A New Threat, Part 1"
#123 "Eyes on the Prize"
#088 "Showdown at Sundown, Part 2"
#122 "The Power to Believe! The Strongest Giant Zushin VS Shooting Star Dragon"
#140 "Soul Binding Gate! The Sealed Future!" #083 "Will The Real Jack Atlas Please Stand Up, Part 1"
#135 "Fight for the Future"
#077 "Dawn of the Duel Board, Part 1"
#078 "Dawn of the Duel Board, Part 2"
#081 "Get With The Program, Part 1"
#082 "Get With The Program, Part 2"
#090 "The Race to Escape, Part 2"
#091 "Clash at Crash Town, Part 1"
#092 "Clash at Crash Town, Part 2"
#093 "The Question of the Card"
#094 "Keeping a Promise, Part 1"
#099 "Trouble for Team 5D’s"
#100 "The Edge of Elimination, Part 1"
#101 "The Edge of Elimination, Part 2"
#106 "Primo's Plan, Part 1"
#107 "Primo's Plan, Part 2"
#108 "Primo's Plan, Part 3"
#109 "Primo's Plan, Part 4"
#114 "Operation: Capture Yeager II!" #116 "Momentum Express Development Agency"
#120 "Hold onto Those Feelings! Hand-Holding Djinn"
#129 "Fight to the Finish Line"
#137 "An Approaching Terror - The Citadel of God, Ark Cradle"
#138 "Suspension Bridge toward the Future, The Rainbow Bridge Bifrost"
#141 "Duel of Despair! Fortissimo the Mobile Fortress!" #142 "A Life-or-Death Battle! Machine Imperial God Dragon Asterisk"
#143 "The Miracle of Life, Life Stream Dragon!!" #144 "Beginning of the End, Struggle to the Death for the Future!" #147 "A Hope Bound for the Future!" #148 "Just One Chance to Turn It All Around"
#150 "Entrusted Feelings of My Father"
#154 "Shining Forth to the Future"
This page was last edited on 17 November 2017, at 03:57.